Add four external USB 3.0 ports to your notebook or Ultrabook™ with a slim, portable hub. 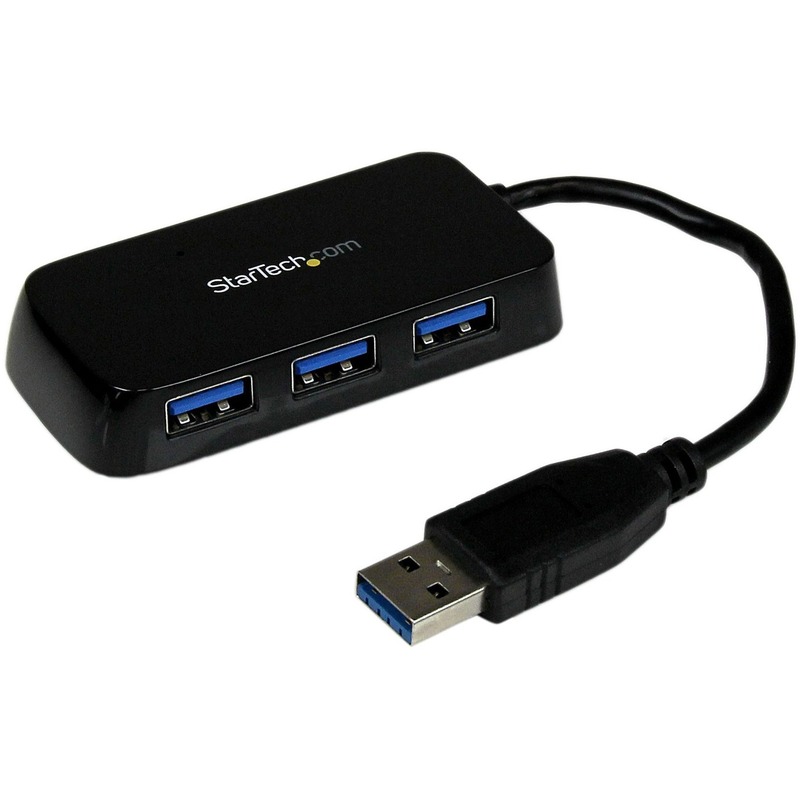 The ST4300MINU3B Portable 4 Port SuperSpeed Mini USB 3.0 Hub (Black) lets you expand your USB connectivity by turning a single USB 3.0 port into four external USB 3.0 ports. The integrated cable design makes this mini USB hub the perfect accessory for your Mac® / PC notebook or Ultrabook™ computer. The 4 Port USB 3.0 hub supports USB 3.0 data bandwidth (5 Gbps - up to 10x more than USB 2.0) and is backward compatible with USB 2.0 and 1.1 devices, ensuring flawless performance from all of your USB peripherals/devices, regardless of their age. Ideal for home and business users who require portability, the external USB 3.0 hub is USB-powered and features a rugged, compact design with a built-in cable so no additional cables are needed to connect the hub to your system. Backed by a StarTech.com 2-year warranty and free lifetime technical support. Warning: Cancer and Reproductive Harm - www.P65Warnings.ca.gov. Add four external USB 3.0 ports to your notebook or Ultrabook™ with a slim, portable hub. The ST4300MINU3B Portable 4 Port SuperSpeed Mini USB 3.0 Hub (Black) lets you expand your USB connectivity by turning a single USB 3.0 port into four external USB 3.0 ports. The integrated cable design makes this mini USB hub the perfect accessory for your Mac® / PC notebook or Ultrabook™ computer.